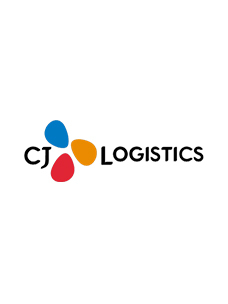 CJ Logistics (CEO Park Geun-Tae) will launch a delivery service using environment-friendly electric trucks on Jeju Island, an area known for its cleanliness. Prior to this, CJ Logistics signed a business agreement with Gwangju City and Joylong Korea to promote the development of the electric vehicle industry and the use of electric vehicles in September. Through this, CJ Logistics will launch eco-friendly delivery service via electric trucks on a broad scale by actively introducing electric trucks and developing electric truck-based delivery technology in Korea. In overseas countries, large logistics companies such as DHL and FedEx are putting electric trucks in tentative operation and are planning to introduce more electric vehicles in the future. The electric vehicle introduced this time is a compact one with a maximum load capacity of 500kg produced by a Korean company. The vehicle can run about 70km on a single charge and its maximum speed is 95km per hour. In particular, the vehicle can climb a ramp of up to 20.6°. The vehicle is 1.4m wide so that it can run smoothly on hills and narrow roads that are common during deliveries. 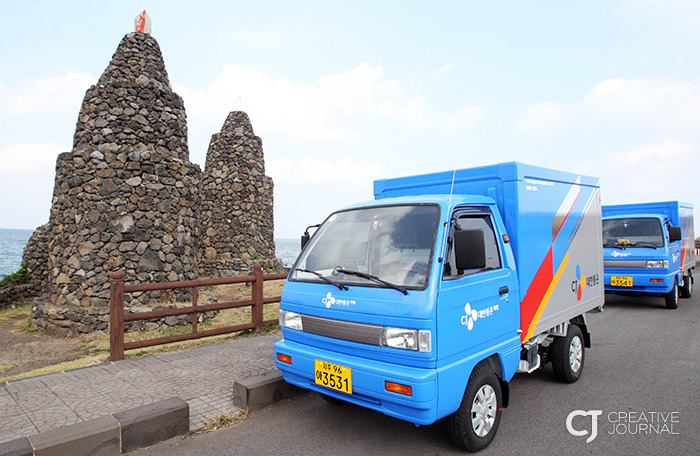 CJ Logistics started delivery services with two small electric vehicles on Jeju Island and analyzes information obtained during the services. Based on the results of the analysis, the company will boost the efficiency of electric trucks in the future by conducting various tests. The main reason for implementing a delivery service via electric trucks on Jeju Island is that Jeju Island has excellent electric vehicle infrastructure. As of September 16, 2016, 91 electric vehicle charging stations were in operation and more than 3,600 electric vehicles were registered on Jeju Island. The figure accounted for about 45% of electric vehicles registered nationwide. CJ Logistics has been delivering approximately 100 home shopping packages in downtown areas such as Ildo-dong, Ido-dong, and Yongdam-dong on Jeju Island since November 9. The company primarily offers short-range services and its delivery trucks run about 20km a day. CJ Logistics checks battery performance by analyzing data such as climate, driver's driving patterns, charging time and the number of charging times after installing equipment and dash cams to collect driving information inside the electric vehicles. In addition, the company plans to map out an optimal operation plan by utilizing the electric trucks’ operation logs and dash cam data collected in real time through a remote-controlled system. In particular, CJ Logistics will put forth efforts to put more electric trucks into operation for delivery services by studying delivery truck operation models suitable for the nature of delivery services in that delivery trucks make many stops to deliver packages compared to other vehicles that run for a long time without stopping and accumulate know-how and discover areas for improvement. This delivery service was conducted through mutual cooperation between CJ Logistics which pursues eco-friendly logistics service, and Jeju Island pursuing a "carbon-free island" project. 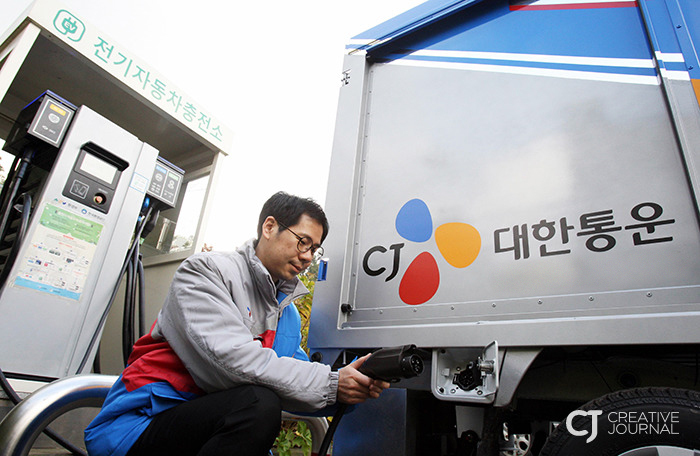 Since August, CJ Logistics has negotiated with the Jeju Provincial Government for the introduction of electric vehicles. As of October, they have been conducting trial runs and functionality tests in Jeju City. 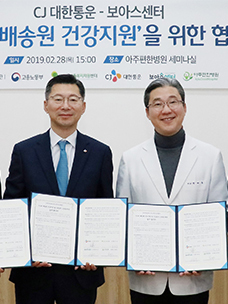 On the other hand, CJ Logistics has been taking the initiative in environmental preservation and greenhouse gas emission reduction activities as the largest general logistics company in Korea. In particular, CJ Logistics is introducing eco-friendly electric carts for delivery services by the elderly for the creation of jobs for senior citizens. 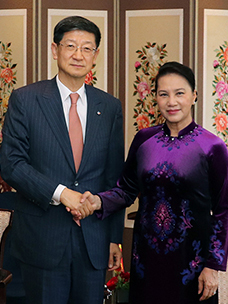 In addition to this, CJ Logistics is carrying out projects to create forests in downtown areas with proceeds from selling honey from bee farming in urban areas and to give heating fuels to those marginalized from new and renewable energy by planting forests for the creating of energy by making effective use of idle land of highways in partnership with the Korea Forest Service and the Korea Highway Corporation.